Black Satin Gloves with Snap Buttons.ncludes: One Pair of Black Satin Gloves with Snap Buttons. Available Size: One Size Fits Most Adults. Material: 90% Nylon, 10% Spandex. *Costume and Accessories Not Included. Sold Separately. Available in black. 18.5" long from top to middle finger. Shiny satin finish is accented by faux button detail. Stretchy material. One size only. 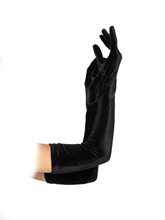 Velvet Long Length Gloves are black color gloves.The material of the gloves is velvet.These are long sleeves gloves.These can go perfectly with any costume. 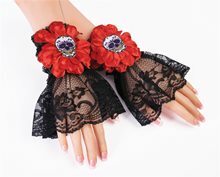 Goth Adult Gauntlets.Includes: One Pair of Goth Adult Gauntlets. Available Size: One Size Fits Most Adults and Teens. *Costume and Accessories Not Included. Sold Separately. 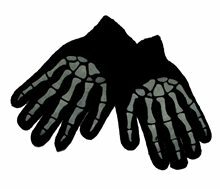 Goth or punk, add character to your costume with a pair "tough gloves" on Halloween. These are Black in color. It includes a pair of Gloves. The costume and the wig is not included. Not intended for use in play by children under 14 years of age. Punk Buckled Wrist Cuff.Includes: One Punk Buckled Wrist Cuff. Available Size: One Size Fits Most Adults and Teens. *Costume and Accessories Not Included. Sold Separately. 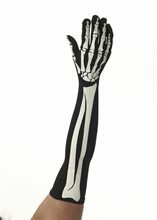 Complete your party costume with this Punk Buckled Wrist Cuff! Amazing Product! Try it.